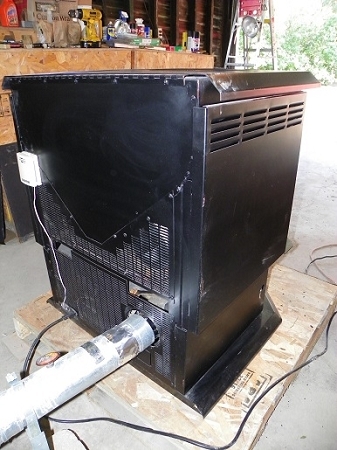 The unit sold in this auction is a Reconditioned Unit. We have a NEW Unit available for $2750 and if you want it then we can set up a special buy it now for you. The NEW Unit comes with a Limited Lifetime Warranty. If you want it call us at 1-319-298-0500 as we will run it through Ebay to avoid bypassing or circumventing Ebay Fees. We sell Used, Demo, Reconditioned, and NEW Units and call us to discuss which unit you want and we will arrange an Ebay buy-it-now to avoid bypassing or circumventing Ebay rules and fees. Note that Model I (One) is a Wood Pellet Stove and you have to buy a Corn Conversion Kit to make it multi-fuel. Model I Gold Door is $200 more. Model II(Two) is originally designed as a multi-fuel stove and no changes or conversions are needed to burn corn or other fuels. Model II Gold Door is $550 more. The Options available are: (1) Gold or Brushed Nickel Trim (Door and Grille) $550, (2) Fireplace Insert $300 (see second picture), (3) Fireplace Surround $250, (4) Log Set $175, (6) Wall Thermostat Dial $35, Digital $72, (7) Remote Thermostat $295, (8) Fresh Air Kit $145, (9) Flue Exhaust Kit $365, (10) High Temperature Caulk $9.50, (11) POWER OUTAGE Module add $199. At a low particle emission rate of 0.90 grams/hr this unit meets or exceeds the EPA Certified Phase II Emissions Standards at 7.5 grams/hr for non-catalytic wood stoves and 4.1 grams/hr for catalytic wood stoves. Wood pellet stoves are non-catalytic. It also meets or exceeds the strict CALIFORNIA Standards, COLORADO Phase III Approved, state of WASHINGTON Standards (less than 4.5 g/hr. ), and the strict OREGON Standards (less than 2.5 g/hr) for particle emissions. There is a lifetime warranty for as long as you own the product. You know the workmanship has to be superb to offer this. The LIFETIME WARRANTY covers the heat exchanger, frame housing, door, fire pot, auger, agitator, and a 2 YEAR WARRANTY on electronics. Be careful what you buy and from whom you buy. 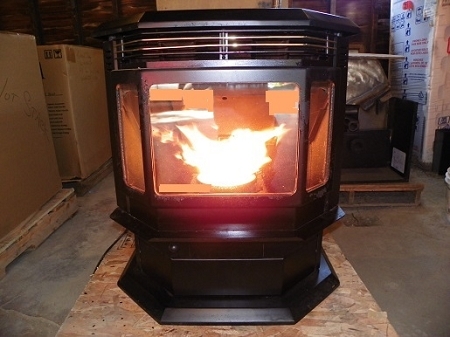 We are a Dealer specializing in corn stoves and can help you through the installation as well as any on-going trouble shooting if necessary. Be careful as others may not have the capability to do that. For customers with forced-air ducting furnaces, we have some simple recommendations on how you can revise your existing duckwork to improve the performance of this free standing 2008 Model. However, if you want to spend more money, then we have another furnace specically designed for forced air called The Forced Air Ductor. It can be hooked up to your existing ductwork. 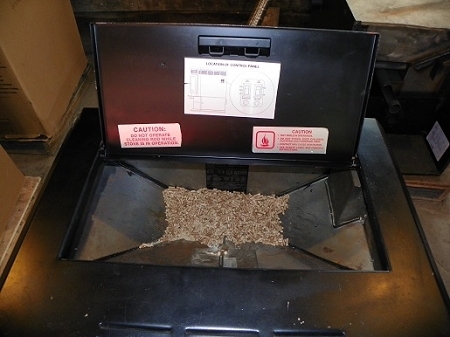 It is listed as Forced-Air Corn Furnace and we have one that just arrived and it is found in our Ebay Stove. . It is more expensive, spend more and get more. Grab it as it just arrived! Contact us by phone or E-mail for additional comments. Customer may pick this item up in person or have it shipped by a commercial freight carrier 400 lbs to the nearest large-city Main Terminal serving the customer's geographic area and the Customer will pickup the item at this large-city Main Terminal. We estimate Freight to range between $185.00 to $245.00 and we will charge an average flat rate of $215.00 for the U.S. mainland. 24 Karat GOLD, Heating capacity up to 2500 sq. 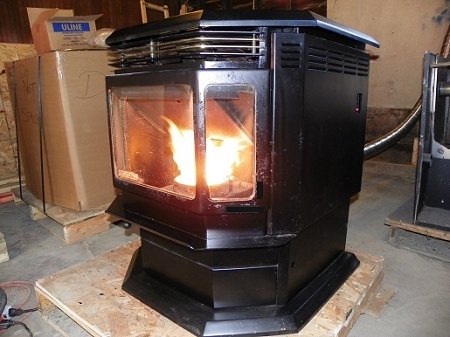 ft., BTU output up to 47,500 BTU/Hr., Hopper capacity 80 lb, Multifuel: wood pellets or corn. EPA Particle Emission rate was tested at 0.90 grams/hour. Weight 350 lbs, 28" wide X 30" high X 27" deepElectrical 110 VAC, 3 Amps, 60 Hz, a POWER OUTAGE Module is available, Safety Tested and Listed to ASTM-E 1509, ULC/ORD- C 1482, (UM) 84-HUD, and EPA Approved. Manufacturer: American Home Hearth Company.